Here’s a drill taken directly from my 125 Dynamite Drills ebook that I thought you might enjoy. It helps students understand the importance of correct distance, line and timing… 3 critical factors for fighting success. Method: Both people stand with left leg forward, one “slide” away from each other. Together they simultaneously make reverse punch to the body, hitting and then recovering to their original stance. Immediately upon return to their stance, they slide in again and repeat the process. The object is to build a “beat” to which you punch so that you both punch, punch, punch at exactly the same time. After the 2nd punch, Person #1 changes stance as they pull back to recover (making sure they are out of striking range) and slides in to punch in the opposite stance with the opposite hand, before Person #2 delivers their punch. The idea is for Person #1 to break the timing and hit before Person #2 has a chance. Person #1 must make sure that they step to the outside line of Person #2 so they retain the advantage of having the sweep if required. This is a great drill for timing and line work. Notes: This drill can be done with one person and a punch bag. 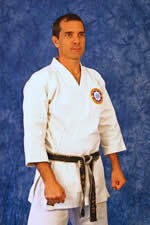 For 100+ more karate drills and exercises to sharpen your skill sets you can get your copy of “125 Dynamite Drills” here. In the book I also reveal the advanced method for this drill plus a ton of others too. I have those red/blue puzzle mats on my dojo floor, which is good because it allows us to do plenty of sweeps, throws and takedowns during our kumite sessions without the associated risk of injury (particularly where kids are concerned). But one of the problems is that the mats like to move about from time to time particularly in the summer months as they heat up, expand and buckle. Especially after a big class with loads of students, even though the mats are secured on all 4 sides by walls and railings on the floor. I simply went to Walmart (shudder!) and bought 2 x 20′ self adhesive rolls that are 2″ thick and stuck one strip to the carpet under the mats (Velcro side down) , and peeled off the backing to stick the mats to the Velcro. The executive board of the International Olympic Committee (IOC) met this week to choose two sports from a short list to be voted on in Copenhagen on October 9 for inclusion in the Olympics. In a separate poll, the International Sports Press Association voted karate as the first sport to be included, which is an indication of what the media wants to see… but the IOC board wasn’t interested, again. The World Karate Federation has been working very hard for years and years to get this inclusion and has been very close in the past, yet our martial art has been rejected time and time again. I’m sure it’s been a frustrating week for all those involved, and all I can say is thank you for your continued efforts in pushing karate to become an Olympic sport.